It’s all change at Cardiff Central Square, once home to the Cardiff Central bus station as a new development makes this the home of BBC Cymru Wales. 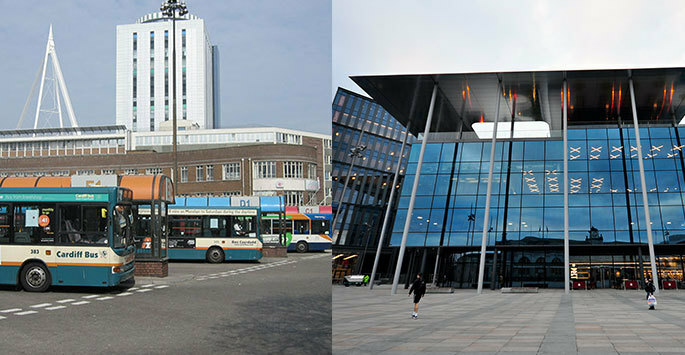 It’s all change at Cardiff Central Square, once home to the Cardiff Central bus station. The redevelopment of the site includes the new BBC Cymru Wales, with the interior designed by ID:SR, part of architecture firm Sheppard Robson, and the fit out completed by Overbury’s Northern team. On 14 January 2019, Overbury handed over the fit out to the BBC Workplace team to begin their phase of the works. A decade later, the change is noticeable across the square, and inside the bespoke-built 282,500 sq ft building for BBC Cymru Wales. Central Square is described as “A New Gateway to the Capital of Wales” and will include new office space, retail, as well as food and drink offerings.